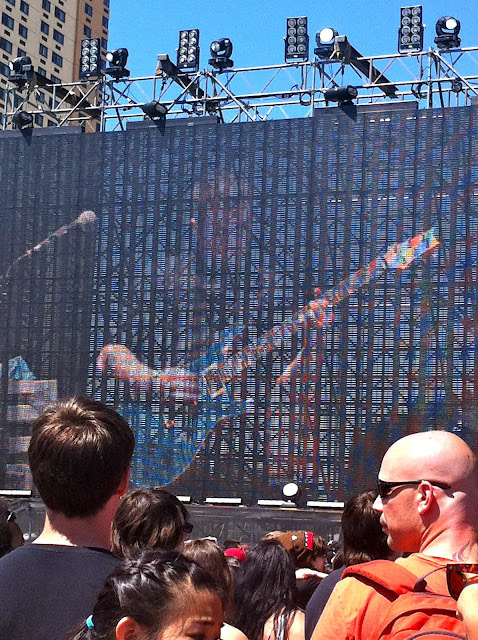 Andrew's band, This Good Robot, play the main stage at Bamboozle. on a line that stretched at least half a mile down the boardwalk. for 2:05pm and we were pretty far back on line, even after getting there so early. ice cream stands, and plenty of beach goers out enjoying the perfect weather. and ran towards the giant black stage set up all the way at the opposite end of the boardwalk. before they took the stage. They were amazing! I had no idea what to wear. I decided to go for a very simple, casual look. This Good Robot on the main stage! It was a little too bright to see clearly, but that is my cousin Andrew on a 50 foot screen! A very blurry shot of Andrew on stage. Michael, the lead singer, standing on the crowd. That last photo was taken by a professional photographer from the stage. It's amazing, isn't it? I sort of got another angle of it from the crowd.